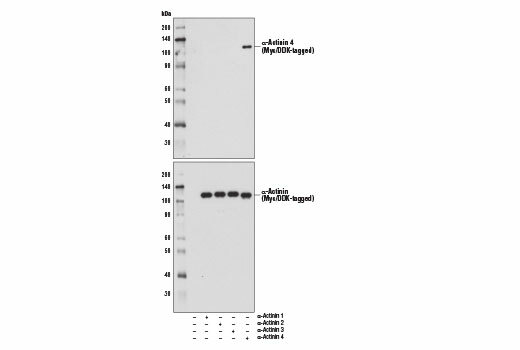 Western blot analysis of extracts from various cell lines using α-Actinin 4 (D7U5A) Rabbit mAb. Western blot analysis of extracts from 293T cells, mock transfected (-) or transfected with constructs expressing Myc/DDK-tagged full-length human α-actinin proteins (+), using α-Actinin 4 (D7U5A) Rabbit mAb (upper) and Myc-Tag (71D10) Rabbit mAb #2278 (lower). 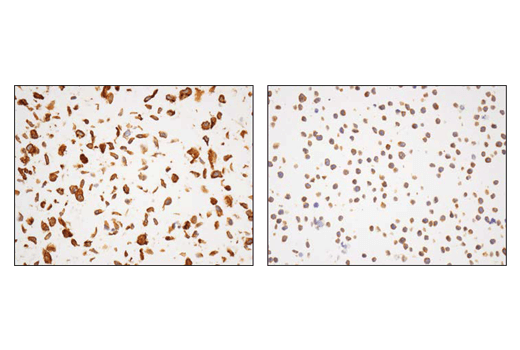 Immunohistochemical analysis of paraffin-embedded A549 cell pellet (left, high-expressing) or MOLT-4 cell pellet (right, low-expressing) using using α-Actinin 4 (D7U5A) Rabbit mAb. 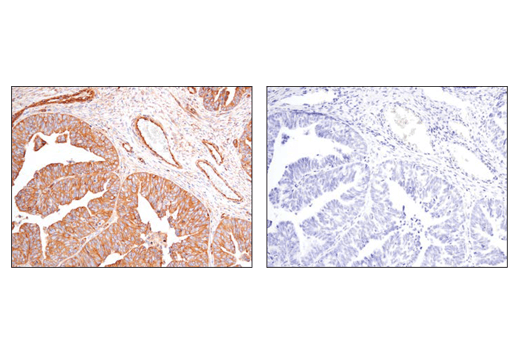 Immunohistochemical analysis of paraffin-embedded human serous papillary carcinoma of the ovary using α-Actinin 4 (D7U5A) Rabbit mAb (left) compared to concentration matched Rabbit (DA1E) mAb IgG XP® Isotype Control #3900 (right). 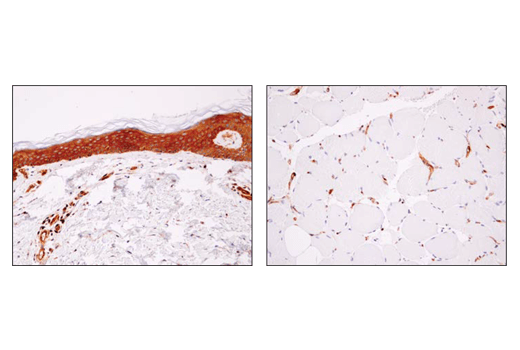 Immunohistochemical analysis of paraffin-embedded human skin (left) or skeletal muscle (right) using using α-Actinin 4 (D7U5A) Rabbit mAb. Note the lack of staining in skeletal myocytes. 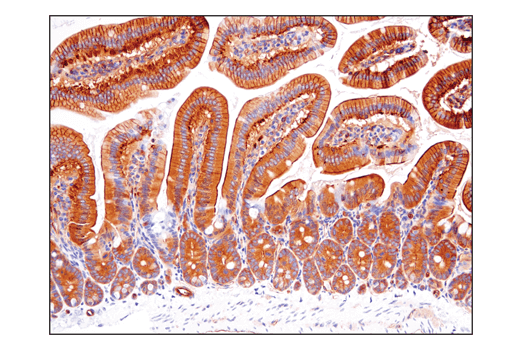 Immunohistochemical analysis of paraffin-embedded mouse small intestine using α-Actinin 4 (D7U5A) Rabbit mAb. 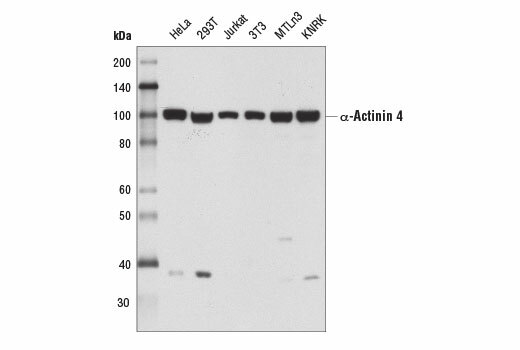 α-Actinin 4 (D7U5A) Rabbit mAb recognizes endogenous levels of total α-actinin 4 protein. This antibody does not cross-react with other α-actinin proteins. Monoclonal antibody is produced by immunizing animals with a synthetic peptide corresponding to residues surrounding Ala6 of human α-actinin 4 protein. The ubiquitously expressed α-actinin 4 (ACTN4) protein typically localizes to the cytoskeleton but extracellular stimuli will prompt nuclear translocation in some cells (4). Research studies suggest that ACTN4 can mediate cell signaling and regulate gene expression as a transcriptional coactivator (5,6). Increased expression of ACTN4 protein and amplification of the ACTN4 gene are seen in many cancers and correlates with poor prognosis and metastasis (7). Mutations in the corresponding ACTN4 gene are responsible for focal segmental glomerulosclerosis (FSGS1), a severe renal disorder characterized by reduced kidney function, proteinuria, and progressive kidney failure (8). Honda, K. et al. (1998) J Cell Biol 140, 1383-93. Aksenova, V. et al. (2013) Oncotarget 4, 362-72. Khurana, S. et al. (2011) J Biol Chem 286, 1850-9. Watabe, Y. et al. (2014) Cancer Med 3, 613-22. Kaplan, J.M. et al. (2000) Nat Genet 24, 251-6.